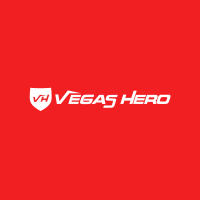 Vegas Hero Review (2019) ++ GET Casino *Bonus Codes* Inside! Vegas Hero review includes bonus info, free spins and more! Who doesn’t love heroes? When Casino Professor was just a young man, he used to idolize old heroes such as Phantom and Lucky Luke. At that time, there weren’t a lot of so-called superheroes—or at least you didn’t see all these Hollywood movies about them. Spider-Man, Superman, and Batman surely weren’t all that popular back then, although a lot of these iconic characters are actually older than you’d think. This time, The Professor will look at a spanking new casino called Vegas Hero. We should note that this site doesn’t have anything to do with the horrific tragedies that happened in Las Vegas, although the casino was released in the December of 2017. It surely must have been hard for Genesis Global Limited, the company behind this casino, to have come up with such a name and theme just before those shocking events in October. There are two kinds of casinos—those that give their loyal customers extras and those that do not. Luckily, Vegas Hero seems to offer a lot of cool things to their members, even from the get-go. Many campaigns and competitions await those who sign up here. On top of all the monthly and daily stuff, you will also find a lucrative VIP system. If you decide to concentrate your gaming here, you will find yourself in the VIP club and get all kinds of rewards. We really wouldn’t have it any other way. Especially the first one of these bonuses really catches our eyes. The fourth one is hardly that good, but you’re still getting a lot to play with. The Professor certainly likes it when he can get new deposit bonuses each time that he makes deposits. It seems like Vegas Hero are using the same bonus code on every one of your deposit bonuses, except for bonus number one, which requires no code whatsoever. You should use WHERO2, WHERO3, and WHERO4 to get your bonus on the second, third and fourth deposit respectively. Fifty free spins might not sound like much, but they are given on games that are actually worth checking out. You can pick and choose between Dazzle Me, Glow, Sparks, Neon Staxx, and Stickers here, which is more than can be said of a lot of other casinos. None of these titles have overstayed their welcome when it comes to free spins offers, so we think that Vegas Hero is truly onto something here. It’s just a shame that you only get 50 free spins and—what’s worse—you can only play 10 per day. Still, it’s certainly nice to be able to try new games. The bonus terms and conditions can make or break any bonus. Here you have a 40x wagering for your bonus amount and 40x wagering for your free spins wins. This sound pretty fair, although we wouldn’t mind seeing something like 35x here instead. Also, you should read through the site yourself to find out more about the rules associated with playing with your bonus. We won’t bother copy-pasting the most menial stuff here, and the things could always change in an instant when it comes to upstart casinos. Vegas Hero is on top of their game when it comes to payment methods. You can find all the following methods here: Visa, Mastercard, Maestro, Trustly, EcoPayz, Neteller, Skrill, Ukash, Giropay, Entropay, Zimpler, iDeal, Euteller, Sofort Banking, Paysafecard, and Entercash. It would seem like Vegas Hero are only starting when lists of other casinos’ payment methods have already come to an end. This truly is one impressive offering. “Advanced and innovative mobile technology”—this is what Vegas Hero says they are offering their players. And rightfully so as you can play most of their over 1300 games on your mobile phone as well. When it comes to Genesis Global Limited casinos, you really don’t have to be worried for your safety. This casino has created other popular brands as well, including Sloty, Casino Cruise, and Spinit, and none of these casinos have presented players any problems in the past. To top this, Vegas Hero has scored licenses from both Malta and the UK. At the time of writing, it seems like Vegas Hero has only restricted gamers from USA, Russia, Italy, France, Guyane, Reunion, Guadeloupe, Martinique, China and Hong Kong. We are not quite sure, however, whether this is an all-encompassing list. You had better check with Vegas Hero yourself and see if they let you join or not. Vegas Hero certainly has a lot of things going for them. They have the games, they have the welcome offer and they most definitely have a theme that separates them from the pack. Their casino site is one of the more beautiful and quirky ones that we’ve seen in a while, but that was to be expected from Genesis Global Limited. It seems that this company has gone and done it once again. The Professor really appreciates what Vegas Hero is giving you. The sheer amount of games is enough to make them one of his favourite casinos, but what’s more is that the Professor kind of feels like he’s a hero himself playing here. When he’s winning from these games, he feels like Lucky Luke spinning his revolvers or the Phantom haunting his criminal prey. Yes, the Professor does seem a bit coocoo at times, but we guess that’s what a brilliant online casino such as Vegas Hero can do to you. Remember to write your own Vegas Hero review below!